This ride travels through one of the highest mountain ranges of Spain the Sierra Nevada’s situated south of Granada. Riding through this ever-changing landscape is an unforgettable experience and no two valleys, ravine or summit are alike. 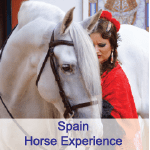 The rides in spring, late summer and autumn explore the ancient Moorish bridle paths linking the picturesque mountain villages and terraced farms of the Alpujarras. In summer the trails follow the old droving routes and paths over the high Sierras. This is where you will experience the wilderness and beauty of the mountains, their vastness and ever-changing panoramic views. Starting from Bubion, the riding trails follow ancient Moorish drovers’ paths through steep valleys filled with Mediterranean almond and walnut groves up to high summer pastures irrigated by the snow melt. You pass through pretty white villages with narrow winding streets and ancient Moorish architecture. On some of the very steep descents it is necessary to lead the horses. Transfer from Malaga airport and transfer to the village of Bubion where you will be met by the trek organiser and guide. Supper and accommodation in a comfortable village guest house in Bubion. Heading east you set off for the village of Trevelez, at 1,476m, this is the highest village in Spain. During the morning you will follow the old mule paths through the countryside to the village of Capilerilla, Pitres and then Portugos where you will have lunch on the way. Berchules takes its name from the old Spanish word Berchel, meaning literally, mountain garden. During the morning we take the ancient Moorish bridle path, once the main trade route over the mountains to Granada. As the path passes through terraced orchards and fields, high above the cause of the river, it is easy to see how the area came by its name. Today we head back to the village of Trevelez. Leaving the village of Berchules below we have a steep climb to approximately 2,400 metres. During the morning the route follows dirt tracks through farm and pasture lands up to the tree line. Some canters. Picnic lunch on the edge of the pine woods with wonderful views over the valley of Trevelez, the sea to the south and the Mulhacen 3486m (the highest mountain on the mainland) to the north. During the afternoon we descend on the bridle path through the woods to the village of Trevelez. There are some places one needs to lead the horses for short periods. Today is a shorter ride. Following the forestry track through pine and oak woods you will ride towards the stables high above the villages of the Poqueira. This route offers spectacular views out over the Contraviesa mountains towards the Mediterranean sea. There is some good opportunities for some canters. On the El Marquesado and the Buena Vista ride one night is spend in a high mountain refuge; the other six nights in comfortable village hotels (some with pools). 2019: 27 April – 4 May, 11 May – 18 May, 17 Aug – 24 Aug, 14 Sep – 21 SepNote: Rates are based on the Euros and subject to currency fluctuation. We will convert rates at time of enquiry and confirm final charges prior to final balance.